Do beautiful projectors come in small packages? 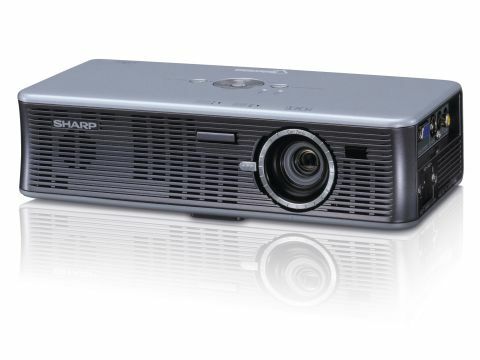 Sharp describes its XR-1S as a 'Pico Portable' projector, which overstates the case as it is small without being tiny. The styling is very slick; however, the focus and zoom controls are tightly tucked in and we found them tricky to operate without covering the lens with your hand. The lens cover is a separate cap that is likely to get lost sooner rather than later. On the left side are VGA, S-Video, Composite Video and mini jack audio inputs, along with the mains power connection, and on the right side are two cooling fans. This projector expels a fair amount of heat and we found it uncomfortable to sit near the exhaust. It's also noisy, but when we switched from regular mode to Eco-mode the noise dropped to a tolerable level while the picture only dimmed slightly, so we'd certainly recommend you use Eco-mode as often as possible. We noticed the outside edge of the projected image had a stepped appearance, which may be due to the relatively low resolution of 800 x 600 pixels, but we haven't seen it on the other models. The small remote has a USB mouse pad and we found the interface was simple to navigate. While we could tell that Presentation mode is the brightest and most usable of the options, we were unable to see any significant difference between Normal, Movie and Picture modes. The XR-1S sells for £949 at Sharp's online store and, while you can find it much cheaper elsewhere, it still failed to win us over.